Bringing You Vermont LLC is a specialty shop, café and catering service that offers a wide variety of amenities. We are family-owned, community-focused and take pride in what we do. Our experienced, knowledgeable staff is here to help and welcome you into the Bringing You Vermont family! We have a variety of products, from homemade candles to wooden toys. We guarantee you’ll find a trinket you love, whether for yourself or someone special. Our café is located right within our gift shop. 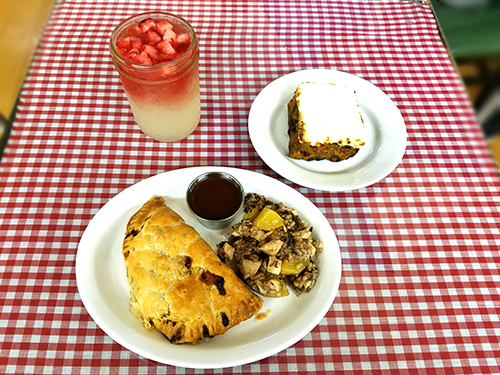 Browse our shop and then stop in for a bite to eat before you leave! We take pride in our long-standing relationship with The Bennington Chamber of Commerce and aim to be a model community business. Having a party? Getting married? We can cater to you. Call us today for a free consultation. We run many different public events throughout the year to enhance our relationship with our customers. Visit our Facebook page and check out our upcoming events. Since 2010, Bringing You Vermont has been sharing the essence of Vermont with others. Our gift shop located in Bennington, VT, offers a wide selection of goodies, including locally-made honeys, candles, maple syrup, jewelry and much more—all showcasing the wonderful spirit of the state. Our affordable assortment of quality goods won’t break the bank and will keep you coming back every time, whether for gifts or for yourself! Looking for something specific? No problem. Our on-staff experts are here to help. We guarantee you’ll leave our store satisfied, no matter if you’re walking away with a tasty treat or unique knickknack. Come for the products, stay for the coffee and wonderful ambiance of our store! We have a café located inside our shop in Bennington, VT where you can rest your legs after shopping or simply enjoy the company of others. Sit down and grab a bite to eat; we offer many different sandwiches, coffees, cakes and desserts to satisfy any preference. We even have vegetarian, vegan and gluten-free options, as well as nut-free foods. We guarantee our products are safe for consumption by those with severe allergies! We’re here to provide you a delightful experience, no matter if it’s your first time with us or just your most recent visit. Come explore all we have to offer! Visit our store today to experience a little taste of heaven, conveniently located in Vermont. We look forward to ensuring you have a truly wonderful time with us. "Amazing food, gifts, and family atmosphere!"